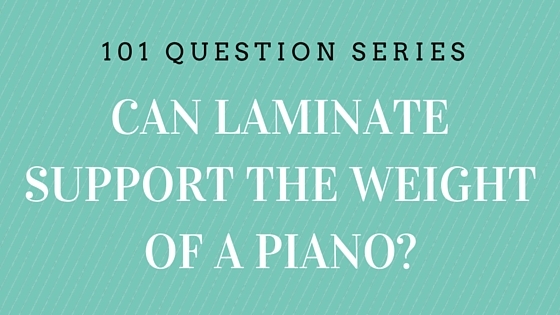 Home >> 101 Questions Series >> 101 Laminate Flooring >> Can Laminate Support the Weight of a Piano? A thicker flooring with a higher AC rating will be your best bet when choosing a laminate for a piano room. The thicker the floor, the more sturdy the laminate flooring. The higher the AC rating, the more durable it will be. AC4, AC5, and AC6 rating flooring is tested to be commercial grade, which can withstand high foot traffic and constant pressure on the surface. With heavy objects, the direct pressure can affect the strength of the locking system. Laminate flooring is a floating floor, and it is critical to ensure that your piano will not pin down the laminate and prevent it from floating. When your laminate is pinned, this will prevent your floor from contracting and expanding with temperature changes, and can lead to buckling and damage to the locking system. If the piano is over 500 pounds, you may want plan out a special installation for your grand piano. Installing a laminate “island” for just the piano can help protect the flooring, especially if it is a larger room. An “island” refers to a section of laminate that is installed with moldings around the edges and flows into the rest of the room, therefore creating an island for the piano that is reinforced on all sides. With any piece of furniture over a laminate, we always recommend to place felt pads beneath the legs. With a piano, we recommend using protective coasters designed specifically from pianos. There are many protector options on the market, and we recommend purchasing a product designed specifically for your type of flooring, and your type of piano. The protectors beneath the legs of your piano will help to disburse the weight to prevent any denting, scratching or even damage to the subfloor below. It will also keep the piano in place, which is ideal for the laminate flooring joints. Lastly, we recommend hiring a professional to move the piano into and out of the room to avoid damage. Quick-Step Eligna White Brushed Pine Piano Room from Customer John P.
The biggest concern with a heavy object is pinning your laminate to the subfloor. With direct pressure on the joints and planks, this can cause buckling if expansion and contraction is blocked. Pianos under 500 pounds should be fine over a properly installed laminate floor. With a floating floor, it is important to stagger joints and properly place transition moldings. If the room is larger than 30′ in any direction, the flooring will need a transition piece to maintain flooring stability. With these things in mind, go ahead and enjoy a newly renovated piano room to play in! Laminate is a great flooring option for your piano. If you have any questions about your specific piano application, give one of our flooring specialists a call. I have new vinyl laminate flooring, and am researching ways to cushion the legs of my piano so as not to damage the laminate. Your advice in the post above states: “With a piano, we recommend using the rubber coasters specifically for pianos. The rubber discs will help to disburse the weight of the legs and/or wheels to prevent any denting, scratching or even damage to the subfloor below….” Everything I’ve read warns against using ANY rubber surface against laminate flooring. Can you explain this contradiction? Wouldn’t wooden or lucite caster cups be a better option? Hi Rube, thanks so much for reaching out. Do you have vinyl plank flooring or laminate flooring? Is the vinyl floating or glued down? 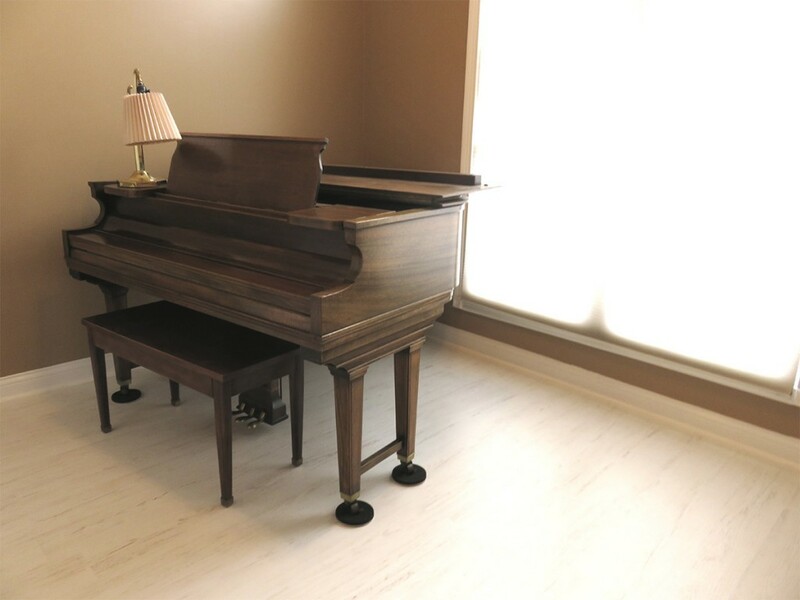 We always recommend buying protectors that are designed specifically for your type of flooring (hardwood, vinyl, or laminate) and specify that they can handle the weight of your piano. With a floating floor, the most important factor is ensuring that your flooring can still float and the piano will not pin it to the subfloor. With a glue down vinyl or hardwood flooring that is nailed to the subfloor, the main concern is denting the flooring, and in this case, a rubber coaster would be ideal. We have updated our article to clarify any confusion with using a rubber coaster, thank you for your feedback. We hope this helps! Please let us know if you have any other questions. We are going to install a safe that weights 1000lbs in another room. Would it hurt the laminate flooring to move over top of it with a furniture dolly? Hi Denise, thanks for the question. You should put cardboard down on top of the floor to roll the dolly to avoid any damage from moving the safe! I bought and installed floating flooring. I then was told about the weight issue. I was due to install a wood heater on the floor the next day. Neither the heater installer or my builder had heard of weight limitations. I cancelled the Heather installation. We ordered a new hearth, a granite slab and cut out a piece of the flooring 20mm less than the hearth and inserted a platform a mm higher than the floating floor. So that the hearth will overlap the floating floor but it will be supported by the inserted platform. I am not happy that I found this out after the floor installation, although I suppose it is better than not at all. This site is all have seen mentioning a weight limitation. But even this is not specific. What about a bookcase for example ? Hi Brian, thanks for your comment. We are happy to hear you were able to find a solution that worked for your project. Any floating floor will contract and expand with temperature changes. The concern is heavy furniture that could ‘pin’ the flooring to your subfloor and prevent it from floating. If the floor gets pinned by heavy furniture, you run the risk of having planks buckle on the surface due to restricted flotation. Although there is no specific weight limit, we recommend being mindful and cautious with heavy objects such as pianos, billiard tables, etc. We recommend using felt pads and flooring protectors to help distribute the weight of your furniture. A bookcase, for example, should not be a problem. If you have any other questions or concerns, please give us a call at 1-800-520-0961. The product literature makes no mention of weight limitations or issues. I don’t think I should have needed to “find a solution”. With the benefit of hindsight the floating floor was a mistake. But it has its uses and does look quite nice. I presume you would council against having cupboards and cabinets that sit on feet. I can’t see felt pads as much help on a china cabinet for instance. Thanks for your feedback, Brian. If you have any specific heavy objects such as a china cabinet, and know how much it weights, you can reach out to the manufacturer of your floor and ensure it is not a concern. As long as your flooring is properly installed with the right underlayment and proper expansion gaps along the perimeter of the room, normal furniture on top is not a concern. Keep in mind that all floating floors are designed with the intention of having furniture on top, and we just want to be extra careful with heavy items. I hope this helps, please give us a call if you have any other concerns! Ineteresting! I wonder how many people have had a problem with this! We get quite a few inquiries about it Alex! The biggest concerns come with a larger piano. Most small versions are just fine! We actually cut out three small squares in the vinyl planking so the wheels of the piano rest directly on the subfloor. Works great and the piano doesn’t move around! Presumably then you regard your floor the same as carpet or Lino, replaceable when you move or dispose of your piano. This is a legitimate way of looking at it. But I initially regarded it as a proper floor without any weight restrictions. Thanks for your comment, Brian. We recommend using rubber coasters specifically for pianos beneath the legs. The rubber discs will help to disburse the weight of the legs and/or wheels to prevent any denting, scratching or even damage to the subfloor below. If you have concerns about a specific object or weight limit, we recommend reaching out to the manufacturer of your floor to get information regarding any weight restrictions or concerns for your specific floor.